At the end of May, my friend invited me to his band’s gig, as part of an international independent artist competition, Emergenza. Various bands of all types of genres were there to play it up as much as possible in the hope of making it to the finals, and eventually a trip to Germany. 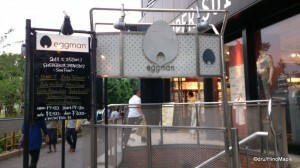 It was an interesting event to visit as it was held in a small live house called Eggman Shibuya. Located next to the NHK Studios and across from a large concert hall, this little hole in the ground could support only a few dozen people at a time. I got there for the start of the show and the first band was on stage. It was a traditional rock band but they were very derivative, nothing too special. My friend’s band was next followed by a metal band called Ricky Typhoon. Ricky Typhoon was a very fun and interesting act where showmanship was the key. The lead guitarist was a portly fellow with long hair and the lead singer was a sassy, desperate, short Japanese woman. I didn’t pay too much attention but my friend said she kept on talking about how certain songs were her anthem to get a husband and to leave her day job as an office lady. Ricky Typhoon started off with serious metal head banging soon after that the lead singer was all over the place keeping the crowd into it and the lead guitarist was all smiles. It was fun to see and the lead vocalist doing her best to get the crowd into the act and some of their loyal fans were really into it. My main purpose for heading to the concert was to see my friend’s band, Bond-T. Bond-T is a 7 person band that plays blues-rock music. It was a fun set with the vocalist utilizing his raspy, probably alcohol loving, voice to his advantage for the style of music. They also had a great harmonica player who would switch between harmonicas to change the sound and power. It was fun to see them all playing together in a group that sounded very happy. It was a great set and I would love to see them again live. The outgoing nature of both the vocalist and the harmonica player did draw the focus to them, but the lead guitarist of the night also did a great job with his solos. The bassist and percussionist did suffer a little in terms of showmanship, but they performed very well and you can’t have a 7 person band with everyone trying to be the centre of attention. They hit all the right notes when it came to their style and I would recommend going to their gigs in the future if you have a chance. I don’t know when or where it will be, but I’ll do what I can to help them fill whatever place they choose to play in. This entry was posted in Culture and tagged band, blues, Bond, Bond-T, Eggman, Emergenza, Independent Music, japan, Ricky Typhoon, rock, Shibuya, Shibuya Eggman, T by Dru. Bookmark the permalink.